The white sands of Watamu Bay and its crystal waters form Kenya's finest stretch of beach. Vasco de Gama passed this way and erected a tower on the headland. The Resort's facilities include; Swimming Pool, Fitness Center, Wheelchair Accessible, Babysitting, Restaurant in Hotel, Tennis, Fishing, Boating/Sailing, Jogging Track, Beach. Turtle Bay Beach Club is the place for a beach holiday and year after year over 3000 repeat guests turning back for a holiday treat of a lifetime. All rooms are en-suite with fans and air-conditioning. Amenities include; Swimming Pool, Wheelchair Accessible, Massage, Tennis, Scuba Diving, Snorkeling, Bicycling, Fishing, Boating/Sailing, Beach. 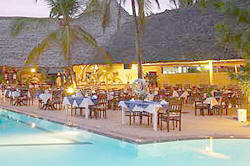 Located on Kenya's north coast The Driftwood Beach Club combines old fashioned family values with relaxed surroundings. 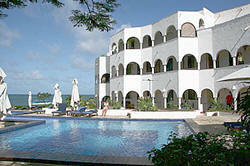 5 mins outside the coastal town of Malindi the Driftwood Beach Club is the oldest hotel on Silversands Beach. First built in 1963 as a small pub, the Driftwood is now a popular holiday venue for both overseas visitors and Kenya residents alike. Coral Key is located right on the Silversand B eachfront 5km from Malindi Town Centre, 6km from Malindi Airport and 110km from Mombasa Airport. A marvelous atmosphere welcomes you to this hotel where the typical mamuti style has been blended with the Arabic style. Coral Key offers days full of sport activity, excursions to the reef and deserted beaches, safaris to the world's most fascinating parks. Built around seven pools, it includes 120 rooms of which 80 superior with A/C cooling and 40 standard, all with a verandah/balcony. Equipped flats also available are rooms for the handicapped. 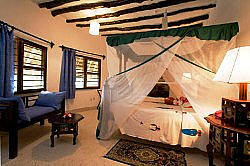 Club Temple Point is a 3 star all-inclusive club in Watamu, just 125 kms. 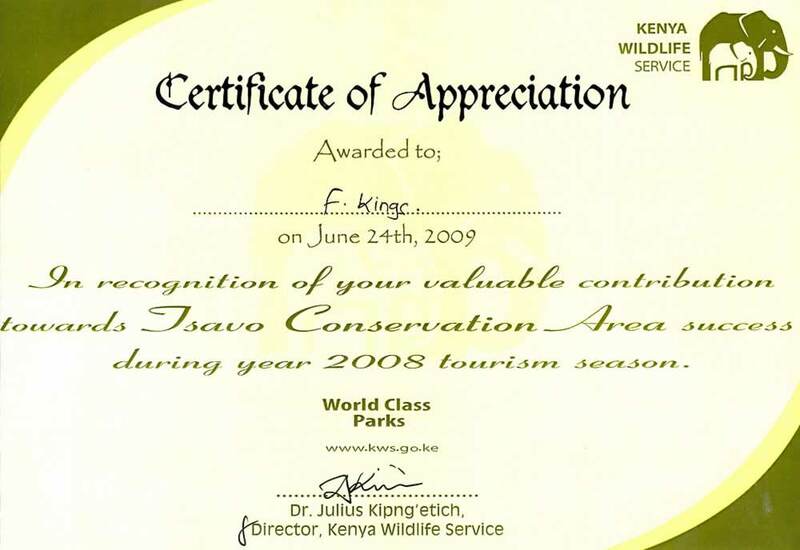 from Mombasa. On site there are various recreational facilities, two swimming pools for cool relaxation. Accommodation is superb, rooms are like that of a delightful home, while the restaurant specializes in Italian cuisine and continental recipes. 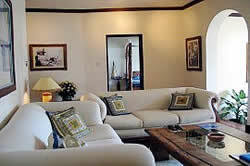 You will experience our hospitality away from home in this treasure waiting to be discovered. beach beds and bar service is available. ceiling fan. Breakfast is served on the spacious verandas of the villas. The hotel has a bar, restaurant, boutique,TV and conference hall. 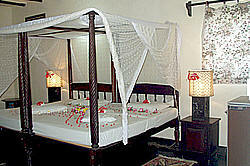 Rooms have big Swahili or pili-pili beds, private facilities, air-conditioning, fan and verandah. Eden Roc Hotel located in Malindi is built on coral cliff, about 4 meters above the high water mark level, this hotel is composed of two main building, and bungalows on 70,000 SQ meters of large tropical park with exotic large trees, shrubs, and flowers. Eden Roc Hotel has 15 luxurious suites and 150 self-contained rooms standard and superior rooms. Standard rooms have a ceiling fan while superior rooms have newly installed air conditioning units. 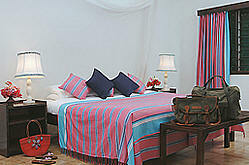 Suites and rooms have a sea view and can be booked either as singles or doubles. 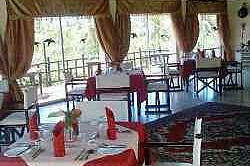 The hotel being under Kenya and German management, gives the advantage to prepare various delicacies of African and European tastes. The hotel chefs can also cater to specific dietary meals. 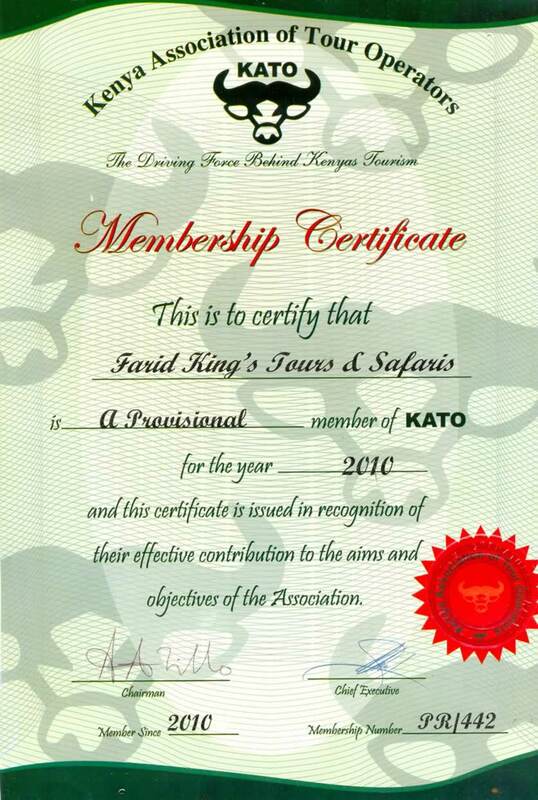 Facilities include; fresh water swimming pools, 1 sea water swimming pool, 1 kids swimming pool. 2 flood lit tennis courts. Conference facility with 80 person sitting capacity, Video and television room with satellite dish.